Today we are building a very useful project in which we can control the LED lights using our voice through Smart Phone. In this project, we will send voice commands from Smart Phone to Raspberry Pi using Bluetooth Module and Raspberry Pi will receive that transmitted signal wirelessly and will perform respective task over the hardware. We can replace the LEDs with the AC home appliances using relays and can build a Voice Controlled Home Automation Project. Bluetooth module consists two things one is Bluetooth serial interface module and a Bluetooth adaptor. Bluetooth serial module is used for converting serial port to Bluetooth. You can directly use the Bluetooth module after purchasing from market, because there is no need to change any setting of Bluetooth module. Default baud rate of new Bluetooth module is 9600 bps. You just need to connect rx and tx to controller or serial converter and give 5 volt dc regulated power supply to module. First of all user need to enter AT mode with 38400 bps baud rate by pressing EN button at Bluetooth module or by giving HIGH level at EN pin. Note: all commands should ends with \r\n (0x0d and 0x0a) or ENTER KEY from keyboard. Working of this Voice Controlled LEDs project is very easy. In this project we have used three LEDs of different colors (Blue, Red and Green). A HC-06 Bluetooth Module is used for receiving voice commands output in string format. Raspberry Pi receives that incoming string from Bluetooth Module and compares with predefined string and performs respective task. In this project, to provide the voice commands to Raspberry Pi from our Smart Phone, we have used AMR Voice App in Android Phone (Android Meets Robots : Voice Recognition). AMR Voice App can be downloaded and installed from the Google Play Store. You also need to install Google Voice App for this project. AMR Voice app takes the voice as input and converts it into text string using Android mobiles internal voice recognition (Google Voice App) and sends this converted text serially over Bluetooth. Then AMR voice app records this voice and sends it to Google Voice app to convert it into the text string format. Now this converted string is sent to Raspberry Pi via Bluetooth module and Raspberry Pi reads this string from UART port and store in a string in the code. And then compare it with predefined strings, if any match occurs then Raspberry Pi takes a respective action or performs a task. Circuit of this project is very simple, which contains Raspberry Pi 3 Board, LEDs and Bluetooth Module (HC-06). Raspberry Pi reads the Bluetooth Module and control the LEDs accordingly. LEDs Blue, Red and Green are connected at GPIO 17, 27 and 22. Rx and Tx of Bluetooth Module are directly connected to Tx and Rx pins of Raspberry Pi. Remaining connections are shown in circuit diagram. Then go to ‘Advance Options’, select ‘Serial’ and ‘Disable’ it. After adding the line reboot Raspberry Pi by issuing sudo reboot command. Now you can run the Python program given below in Raspberry Pi and you are done! Program is easy and can be easily understandable. So here we have completed building our Voice Controlled Devices using Raspberry Pi. You can further enhance it and modify it for controlling AC home appliances by adding relays. This Project is meant for all Raspberry Pi models which don't have Bluetooth. can we use HC-05 bluetooth module? i have some trouble while doing voice recognition.. Can u teach me how to using or making coding for phyton. cant i just used voice recognition and not using bluetooth? plzz help me.. I have one problem. the above code run at whether python 3 or terminal. As the new Raspberry Pi 3 model B has built-in Bluetooth, do i still require to get this external Bluetooth Module HC-06? If I do not require, do I still follow each and every step stated above to build this project or there is some modifications? Please advise. Thanks. In the given link it is not operated using voice..so please give the program for operating with voice control using inbuilt bluetooth. When i run the above code in python 3, it shows a syntax error. At line 22 "print data1". Saying "Missing parentheses in call to 'print'." Please advise. Thanks. First disable the inbuilt bluetooth of RPi as described in the tutorial. What is the file name to save the pythoncode? can we perform this project without hc06 module? baco'z pi 3 have already bluetooth interface. If you are using Bluetooth module then first disable the inbuilt bluetooth of RPi as described in the tutorial. I have raspberry pi 3 model B. Please give the program for operation with voice commands with inbuilt bluetooth.. In program it is showing error in "import RPi.GPIO as GPIO" this command please help me..
Be it Hc-05 or HC-06 the method is same as far as i know. What error are you getting? Where to paste the code? when the program sends a '#' sign. 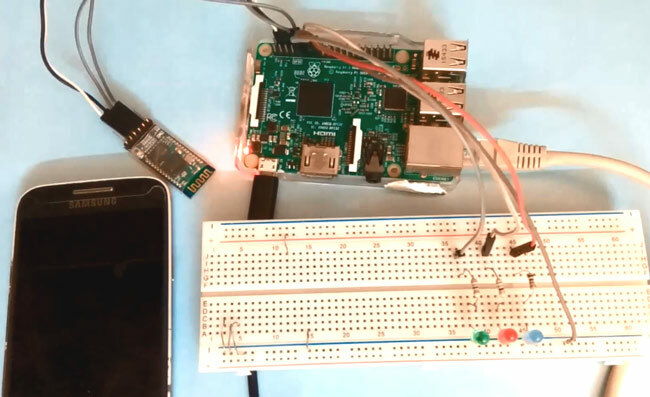 "Controlling Raspberry Pi GPIO using Android App over Bluetooth". additionally I chose "google writing voice in android settings keyboard. Its good work with my voice!. I do not need to use ARM-Voice and "#"
Can i use blue,red and green lamps instead of leds? Sir? I follow all the step that required above. but it doesn't work. But when I connect my bluetooth HC-06 to my android, and send command nothing happened. I already connected the pins to GPIO from my module. and the Led's. but nothing happened. please help me. Make sure the bluetooth connection is successful. Just copy and paste? how to edit this? Do I need to pair my HC-06 Bluetooth module to the Raspberry Pi 3 Model B after I disable my inbuilt bluetooth. I can't run the program please help. How to use the inbuild bluetooth system of Raspberry Pi3 for this project instead of using the external bluetooth module? Please help me..
Is the app still available? I completed everything above this project. But still the python program showing error. And also I didn't get the output. So please help me soon. Only if you state what error you are facing people here might be able to help you. The bluetooth module(hc-06) in my circuit is not powering on. When i remove Vcc and plug it back on, there is a sudden blinking for 2 seconds which comes to a stop. I did everything as stated above and disabled the inbuilt BT. Is there any probable fix? All BT modules should blink when powered properly. If not check your power supply and polarity, if they are good then most likely the module is damaged.